We had an exciting adventure in drywall repair today. View in slide-show and mouse over the photos for the full details. 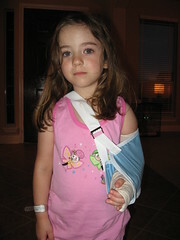 Hailey’s arm is fractured in two places because of an accident at school.